The NSBRC are having their spring/summer event and SureSet will be there. 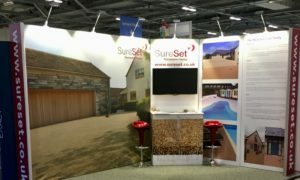 We have a permanent stand at the NSBRC in Swindon but, we will have some SureSet staff on hand to answer your questions. We also have a live demonstration on our DIY Kits, one not to miss. SureSet will be collaborating with Steel Sculptures Ltd for the Chelsea Flower Show this year. We will be showcasing our DIY kits alongside some amazing steel sculptures. The Chelsea Flower show dates are Tuesday 21st May until Saturday 25th May 2019. The biggest homebuilding and renovating event in the UK, meet a few of the SureSet team, our aggregate supplier Long Rake Spar and your Local Approved Installer from 28 – 31 March 2019 on stand C123. The centre welcomed 2,501 adults visitors over the 3 days who generated a massive 12,000 exhibitor requests. 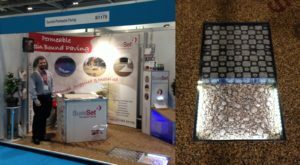 There was a huge interest in resin bound at this show, we spoke to a variety of visitors from self-installers looking to use TradePacks as well as homeowners looking for reputable resin bound installers able to complete any base preparations if required. What can resin bound be laid onto? Resin bound can be installed onto an existing concrete or tarmac base that is in good condition. Resin bound can be installed onto crushed stone or cellular grids like SureCell depending on the application type. It is recommended to use a permeable tarmac base if installing from new and the application type requires this type of base. All base specifications are available for download on our website. How do you keep resin bound clean? Sweep with a stiff broom and occasionally use a pressure washer. How much does resin bound paving cost? SureSet resin bound is priced on varying factors such as colour, area (m²) and application type. We feel the price per m² is on par with a good quality block paving, approximately £55/m² based on an average area of 150-200m² area, this is an installed price that is covered by our 21 year guarantee (excludes any base preparations). All projects are very different and we would recommend you gain a free no obligation quotation. The first show of the year took place at Farnborough Airport in Hampshire. With over 9700 people through the doors over the two days it was one of the busiest shows we have exhibited at! On April 16th, 2018 SureSet hosted their second Approved Installer networking day. 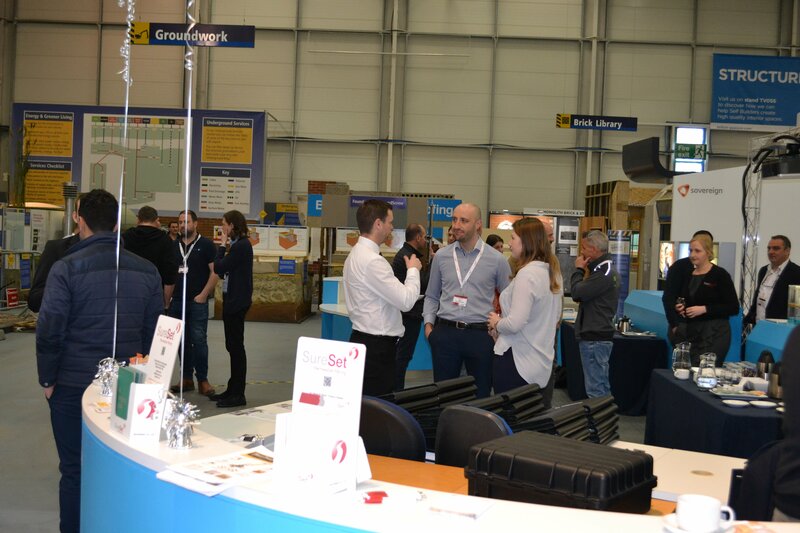 This year the event was opened up to all our Approved Installers and Global Partners who were invited to join us at the National Self Building and Renovating Centre (NSBRC) where SureSet have a permanent exhibition stand. The event kicked off at 11 am with teas and coffees, introductions and a chance to hand out name badges and event schedules. With the endless bad weather, we have all had recently and the outlook of a far more favourable week for installing, some of our Approved Installers were not able to make it in favour of installation jobs that had started to back up, but there was still a healthy turn out of our old and new installers. 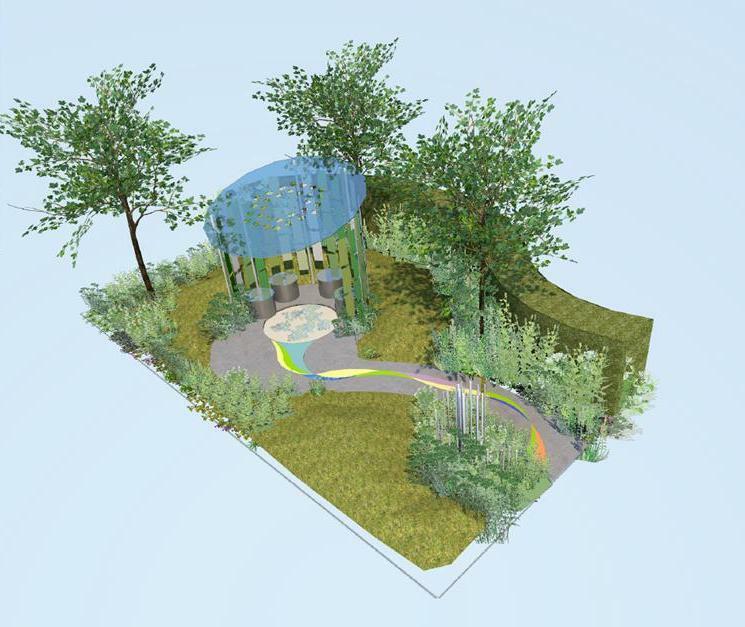 The On the Edge Show Garden at this year’s RHS Hampton Court Palace Flower Show aims to stimulate discussion and prompt even more research on gardening, green spaces and mental health. Designed by Frederic Whyte, built by Charles Benton, sponsored by Benton Landscapes, London Stone and the Centre for Mental Health and supported by their trustee Dame Sue Bailey. On the Edge symbolises a journey from mental ill-health to acceptance. Entered via a narrow path, the garden cuts through a spiky planting scheme with a tall hedge; designed to intensify feelings of claustrophobia. An unnervingly steep staircase leads you into a shady disorienting space. As the journey continues you come across an increasingly open staircase that leads to a therapeutic area alluding to the hope of acceptance. With aggregate donated by Long Rake Spar, we are delighted to be installing the narrow pathway leading to the steep steps and the area at the top of the open staircase; London Stone are installing the steps. We are super excited to see the completed Garden! On Monday October 17 we are holding our first ever Elite Approved Installer Award Ceremony at the National Self Build and Renovating Centre (NSBRC) in Swindon. Our network of Approved Installers support our Installation Team with both residential and commercial resin bound paving projects across the UK. Based on a set criteria – most importantly, customer feedback – we have been recognising one company as our Elite Approved Installer of the Year for several years now. But due to the growth of SureSet and our network of Approved Installers, we decide to take our Installer of the Year Award to the next level with this first Annual Elite Approved Installer Award Ceremony. “We enjoy a great working relationship with our Approved Installers and wanted to recognise their continued support and loyalty to SureSet. We think this event provides the perfect opportunity to not only do that, but for our Approved Installers to get together to learn from each other. Sponsored by Dural UK and Long Rake Spar, this inaugural event will take place on Monday, October 17 at the NSBRC in Swindon, where we have a permanent exhibition (Stand 154). Three Awards will be presented: Elite Approved Installer of the Year, Project of the Year and Customer Service. Two SureSet Approved Installers, Botanica and NW Paving, will make presentations and there will be a demonstration by Quicksetts. Read about our Awards ceremony. Dural UK developed and manufactured our first profiles back in 1981 – 34 years later we are now a major supplier around the world providing support to over 70 countries. Our technical knowledge, customer service, and down to earth attitude at Dural UK has steered us to becoming the top subsidiary and led us to work with brilliant companies like SureSet! Residential and commercial resin bound paving has gone from strength to strength throughout the years and we have developed a resin range of products showcased in a dedicated profile brochure to support the sector, featuring speckled movement joints, straight or formable edging trims and aid the longevity and aesthetics of the resin bound surface. Working in conjunction with SureSet we have developed our movement joints alongside their products to seamless blend into the surface design meaning the end surface not only looks beautiful but is protected against movement and will last, as part of our profiles system. Ann-Marie Powell Gardens were chosen by the Royal Horticultural Society (RHS) to create their official Greening Grey Britain garden at the this year’s Chelsea Flower Show 2016 (24-26 May). “We decided to include SureSet permeable paving into our Chelsea garden with a nifty little fountain system which we hope will demonstrate what happens to excess water when you use this system in your front garden at home. We hope our jet-studded surface inspires and delights, whilst highlighting the water permeability of this material, which makes it so important to our environment. We are so excited to be working with the SureSet team”. Launched in 2015, Greening Grey Britain is a three year initiative to transform 6,000 unloved, neglected spaces into thriving, living places. After the Show, the garden Ann-Marie Powell and her team are creating will be relocated to Angell Town, Brixton. Volunteers will be at the for Health, Happiness and Horticulture garden throughout the Show for visitors to talk to. While Hugh Haines, our Business Development Manager, who has been working with Ann-Marie Powell on this project, will be there on Wednesday 25 May. Ideal for whole landscape areas, or features within a landscape design, the permeability of SureSet resin bound paving eliminates puddles and the potential for flash flooding, prevents weed growth and reduces water pollution caused by oils and heavy metals. If you visit the official RHS Show Garden – for Health, Happiness and Horticulture – please share your photos via social media or email – we’d love to see them! Being held at Holker Hall & Gardens, Cark-in-Cartmel, Cumbria, the festival showcases very best of gardening and horticulture with designers, nurseries, landscapers, businesses and gardening experts all coming together to wow visitors with their innovative show gardens and unique outdoor spaces. Our Approved Installer N W Paving and Landscaping Ltd will be at the Show. The ‘Naked House’ – an opportunity to see what a new build home looks like at ‘first fix’ stage. You can find the National Self Build and Renovation Centre (NSBRC) on Great Western Way in Swindon. Guided tours of the educational zones, including a life size ‘Renovation House’ and brilliant ‘New Build Journey’. Looking for an award winning resin bound paving installer in the North West of England? In 2013 Nick Webster, owner of Botanica Garden Design became a SureSet Approved Installer and established Botanica Resin Bound Driveways. Recent winner of the Marshall Paving National Award for the ‘Best Ethically Sourced Fairstone Project, Botanica are with us at this years’ Homebuilding & Renovating Show. You can find us all on Stand F109 at the NEC April 14 – 17. “Botanica [Nick Webster] had some very good ideas and carried out the work with an eye for detail”. The prize for winning the Marshall Paving National Award for the ‘Best Ethically Sourced Fairstone Project’ was an amazing a five day trip to India to see where the stone comes from. Presented by, former England Manager and Liverpool footballer, Kevin Keegan, Nick was unsure which was more exciting the trip to India or meeting his footballing hero! To find your nearest Approved Installer or for information about how to become a SureSet Approved Installer, please email or call John Fletcher on 01985 841860 or read about how to become an Approved Installer. We have a permanent stand at the NSBRC in Swindon, and in January we were at their National Self Build & Renovation Show. This annual event is definitely one of the most popular they hold, and this year had a record number of visitors. If you missed seeing us in Swindon, you can visit us at Ecobuild in March and the Homebuilding & Renovating Show in April. Taking place at the ExCeL London, 8 – 10 March, and showcasing over 800 leading suppliers and thousands of new and innovative products and services. You will also find at Ecobuild: conferences, CPD accredited learning hubs, exhibitor events, discussions, Q&A sessions and presentations. Stephen Fry has been announced as the special guest and will be interviewed by BBC’s art editor, Will Gompertz, at the end of Wednesday’s conference programme on 9 March. Stephen Fry will also host the BD Architect of the Year Awards dinner that evening. If you wish to learn more about ‘Permeable Resin Bound Paving’ visit stand E4130 in the specifier live theatre on Thursday 10 March at 11am – our presenter Hugh Haines will be on stage to answer your questions. SureSet will also be offering a 10% show discount on SureSet Natural Aggregate TradePacks, visit us on stand E4191 for your discount code. Register to visit Ecobuild here. Register for your two free tickets here. BRE Innovation Park in Watford, directly outside the Barrett Green House. The National Self Build and Renovation Centre on Stand 154. For more information about our exhibitions please contact Yvonne: call 01985 841841 or email. At this time of year many of you will be planning new building projects or making improvements to your existing home. Based in Swindon, the National Self Build & Renovation Centre (NSBRC) is the UK’s only permanent exhibition centre for self-build, renovation and home improvements. We are present at the NSBRC, Stand 154, all year round, but during the Show Emma and Jacqui will be there with advice and information on all things resin bound. You get free expert advice from a line-up of industry experts including architects, project managers, designers and planners. You can even bring your plans and take advantage of the free one-to-one sessions on offer. The professional and helpful team working at the NSBRC are offering guided tours of their ‘life sized’ renovation house and self-build journeys. You can attend a wide range of useful free seminars on topics including budgeting, plot finding, building regulations and planning. You will be among the first to see the very latest products and technologies, and watch them being tested in the ‘live demonstration’ area. The NSBRC is easy to get to – Junction 16 of the M4 – and there’s free parking. If you book in advance you can go for free – tickets are £12 on the day (children are free). Book here. For more information please email or call us on 01895 841873. A week today the UK’s leading landscape event, FutureScape, will once again be bringing landscape contractors, garden designers, architects and suppliers together at Sandown Park Racecourse. You can find SureSet on Stand 14. Hugh Haines and Ned Lowe will be there to talk to you about all things resin bound and permeable. Hugh and Ned will also be offering visitors to our Stand 15% discount codes for TradePack® orders placed before 5pm on 17 December. Our SuDS compliant sub base SureCell is sufficient to install an area up to 36m² is delivered on one pallet (gravel not included). Including UK mainland delivery, prices start at £518.40 excluding VAT. Containing 6mm sized bagged natural aggregate and resin sufficient to install an area of 30m² at a 16mm depth. Each TradePack comes with a 40 litre bucket and paddle whisk attachment (drill not included). Delivered palletised and shrink-wrapped, including UK mainland delivery, prices start from £1,200.00 excluding VAT. Our recycled glass range in a quantity sufficient to install a 30m² area at a depth of 16mm. Spectrum® TradePacks include a 40 litre bucket and paddle whisk attachment (drill not included). Including UK mainland delivery, prices start at £1,530.00 and exclude VAT. Exhibitors – the number of companies exhibiting relevant, high quality products continues to grow, year on year. The LandScape Summit – in association with BALI-NCF, are running a seminar and debate focusing on maintenance and contractors. The View from the Top – a host and a panel of experts answering industry related questions. The Beauty is in the Build – a line-up of industry leading landscapers and landscaping companies will talk and answer questions. The Detail is in the Design – leading designers will debate industry topics and take questions. New for 2015 – FutureScape has co located with FutureArb; a brand new trade event for the arboriculture industry. You can see the full itinerary here. FutureScape takes place at Sandown Park Racecourse, Esher, Surrey KT10 9AJ and is open from 9am to 5pm. Register for your ticket online. If you are there, please stop by and say ‘Hello’ to Hugh and Ned. Come along and see our permeable resin bound paving at the Big Green Home Show at the National Self Build and Renovation Centre in Swindon. If you are working on a refurbishment or self-build project and want to create a greener more efficient, sustainable home the Big Green Home Show is a must. From 23 – 25 October the UK’s biggest event for anyone interested in making their home eco-friendly is taking place. Entry is free if you pre book your ticket, or £12 on the day. Joni and Yvonne are ‘manning’ the SureSet Stand (154) in the Trade Village and available to answer your questions about permeable resin bound paving. The aim of the Show is to help you overcome what can sometimes be the biggest hurdle of all: knowing where to start! A host of exciting innovative technologies and products in action in the live demonstration arena. A choice of more than 75 FREE seminars covering topics ranging from finding the right plot of land to the latest energy saving technologies. ‘Ask an expert’; architects, planners, eco consultants, sustainable homes specialists and renewable technology advisors are all on hand to share their experience on every aspect of sustainable building and the latest legislation. The Trade Village, with more than 220 manufacturers and suppliers offering specialist products and services, you will find SureSet on Stand 154. RHS Tatton Park Flower Show celebrates the very best in gardening and this year marked the International Year of Light with three conceptual gardens inspired by light. One of those three gardens ‘Reflecting Photonics’ was designed by Kate Hart and Helen Elks-Smith from Elks-Smith Landscape and Garden Design – it focussed on work of researchers at the Optoelectronics Research Centre based at the University of Southampton. Before the Show opens Gardens are judged on nine criteria including theatre, colour and innovation with winners awarded Bronze, Silver and Gold. We were delighted when ‘Reflecting Photonics’ was awarded a GOLD medal; even more thrilled to hear that the Garden had inspired visitors to the Show to choose it as winner of the People’s Choice award! This was, undoubtedly an award winning combination of BALI members. As well as ourselves and Elks-Smith Landscape and Garden Design, the Garden was built by Turf ‘n’ Earth and supplied by CED Ltd, Lindum Turf and Barcham Trees plc. This colourful and innovative Garden proved to be very popular – and not only amongst judges and members of the public; Laura Tobin presented Good Morning Britain’s weather from it, the RHS Tatton Park Garden Show on BBC2 with Monty Don discussed it, several newspapers featured it and Samia Ghadia (Coronation Street’s Maria Connor) was photographed on it! Our highly skilled Installers created a ‘waveform’ with edging from Dural and eight colours; Ultramarine Blue, Ultraviolet, Sky Blue, Emerald Green, Bright Orange, Luminous Yellow, Candy Pink and Titanium from our recycled glass range Spectrum®. Within the design, the ‘waveform’ acted as a metaphor for how light refracts along the fibre-optic glass-drops set into the floor forming communication pathways. If you saw this Garden at the Flower Show please let us know what you think via twitter, Facebook or email. Set in beautiful parklands, RHS Tatton Park Flower Show celebrates the very best in gardening and this year marks the International Year of Light with three conceptual gardens inspired by light. One of the three gardens, designed by Kate Hart and Helen Elks-Smith from Elks-Smith Landscape and Garden Design, is ‘Reflecting Photonics’ and can be found in the Inspire zone. The garden design focuses on work by leading researchers at the Optoelectronics Research Centre based at the University of Southampton. Our creative Installers created the ‘waveform’ of the design with edging from Dural and eight colours; Ultramarine Blue, Ultraviolet, Sky Blue, Emerald Green, Bright Orange, Luminous Yellow, Candy Pink and Titanium from our recycled glass range Spectrum®. Within the design, the ‘waveform’ acts as a metaphor for how light refracts along the fibre-optics. The wave is connected to the ‘glass-drops’ set into the floor forming communication pathways. The glass drops are formed as part of the manufacturing process of the new generation of fibre-optics. The International Year of Light was launched by the United Nations aimed at highlighting the importance of this vital energy source in our daily lives through a programme of events. RHS Tatton Park Flower Show takes place July 22 – 26. As well as celebrating the International Year of Light, the Show has three themed zones: Inspire, Feast and Grow to make finding your way around easier. This years’ Show has new features and regular favourites including Young Designer of the Year, a carnival and funfair, Ladies Day, gardening talks and floristry demonstrations and workshops. Tickets are available online. Elks-Smith Landscape and Garden Design are delighted to be working with Andy Craddock at Turf ‘n’ Earth. The versatility and creativity of SureSet resin bound paving is clear to see by its use in Show Gardens year after year. 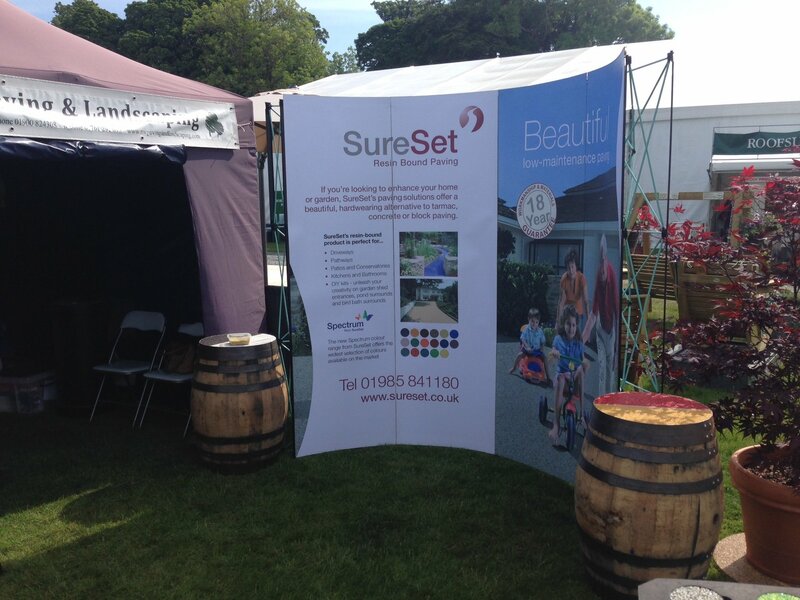 This year you can see SureSet at Chelsea, Tatton and Hampton Court RHS Flower Shows. Sponsored by Viking Cruises to celebrate the launch of their first ocean ship, the Garden at Chelsea Flower Show uses unique artwork to create the impression of a majestic liner cutting through the ocean. The Viking Ocean Garden is designed by Alan Gardner, project coordinated by Hillier Landscapes, constructed by London Landscapes and sponsored by Viking Cruises. More than 150,000 people are expected to attend the Show where you will find cutting-edge garden design, new plants and inspiring ideas to take home. The ‘Spirit of the Aegean’ Garden is sponsored by Noble Caledonia, was built by John Wood Garden Design and designed by Esra Parr Garden Design. Noble Caledonia’s motto ‘Small ships – big experiences’ is reflected in the vibrant colours and drama incorporated into this Garden. 2015 is the 25 year anniversary of Hampton Court Palace Flower Show. There will be various historical themed events including silver anniversary floristry, historic gardens and scarecrows celebrating the past. ‘The Year of Light’ Garden was designed by Kate Hart and Helen Elks-Smith from Elks-Smith Landscape and Garden Design. The Garden focuses on the optical fibre research by leading researchers at the Optoelectronics Research Centre based at the University of Southampton. 2015 was declared the International Year of Light by the United Nations in recognition of light as an all encompassing part of human life. Set in the magnificent parklands of Tatton Park in Cheshire, this Show is a celebration of the best in gardening with a vibrant carnival atmosphere. If you are you going, why not take a picture and send it to us – we’d love to see it and know what you think of the Gardens. Continuing with our 18 year anniversary celebrations we just spent a hectic and enjoyable four days at the National Homebuilding & Renovating Show 2014 at the NEC in Birmingham. Attended by 32,432 people we are now working hard to get nearly 400 requests for samples and more information out to you as soon as possible. Sharing Stand F109 with our ‘Permeable Paving Partners’ – Solihull based Approved Installer GLW Landscapes and aggregate supplier Long Rake Spar we were delighted with the amount of people stopping by for advice and information about SureSet products. By the end of the Show GLW were delighted to have run out of business cards! We were also displaying our SuDS compliant sub-base SureCell® and our just launched pastel colours: Blueberry, Candyfloss, Lavender, Peach, Sherbert and Spearmint – latest additions to our recycled glass range Spectrum®. 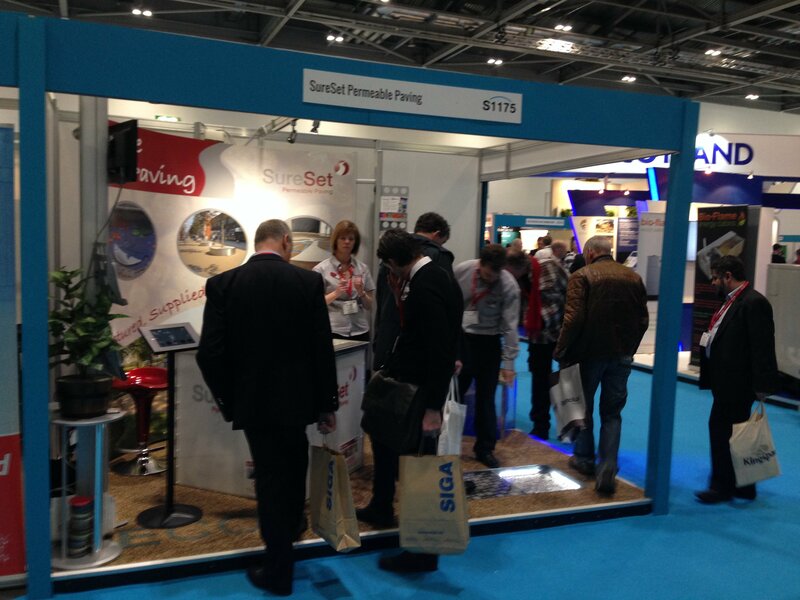 What an enjoyable, successful, but exhausting 3 – 4 days at Ecobuild 2014! With a 4.30am start on March 2, Dan, Gail, Joni and Nat arrived at Ecobuild to set up the SureSet Stand at the Excel. After unloading, Dan and Nat laid 12m² of 6mm Barley Beach at a depth of 16mm on top of 8mm plywood to the SureSet Stand. The SureSet wouldn’t be cured by the time Ecobuild shut at 8pm, so the Team cleared up and reloaded the van; deciding to ‘dress’ the Stand the following day. On March 3, with another early start, Dan, Gail, Joni and Nat arrived at Ecobuild in plenty of time to get the Stand ready before doors opened to the public at 10am. SureSet, Stand S4104 was ready, complete with 18th Birthday balloons, SureCell® installed, water feature demonstrating permeability, DIY table prepared and time to spare! Ben and Hugh arrived on March 3, to ‘man’ the Stand with Joni for the next three days. The stream of visitors was steady with lots of interest in both SureSet and SureCell, our own sub-base, which was installed within the Stand. Our impressive new water feature was proving a popular attraction. On the last day, March 4, Dan and Ned travelled back to Ecobuild to ‘break down’ the Stand – which was a slightly quicker job than putting it up! Everyone was safely back home by 10pm that evening. We are all now busy getting the brochure and sample requests out, as quickly as possible, to everyone who requested them at the Show. Be among the first to see our new range of pastel colours at this years’ Ecobuild. You can find us on Stand S4104 in Hall S4 at London’s Excel March 3 – 5 demonstrating our exciting eco-friendly alternative to traditional paving and introducing our new perfectly pastel shades of Blueberry, Lavender, Peach, Sherbert and Spearmint! This hugely popular annual exhibition; the sustainable design, construction and energy event for new build, refurbishment, commercial and domestic buildings, is the perfect opportunity for us to launch these exciting new additions to our recycled glass range Spectrum®. Last year at Ecobuild we demonstrated our commitment to sustainability by launching our own SuDS compliant sub-base SureCell®. SureCell is an interlocking honeycomb structure that is quicker, cheaper and easier to install than alternative bases. Ideal for small areas such as driveways, when SureSet is laid on top it provides a fully SuDs compliant surface. Specialising exclusively in permeable resin bound paving, SureSet has been manufacturing high quality resin bound paving and installing both residential and commercial projects since 1997. Our huge choice of colours and textures make SureSet ideal for surfaces required to be permeable, durable and maintenance free. Anyone looking for ideas or inspiration should pay a visit to our new permanent exhibition at the NSBRC in Swindon. The NSBRC is the only permanent exhibition centre in the UK for self build, renovation and home improvements in the UK. You can find us on Stand TV 154 – it’s free entry and open from Tuesday to Sunday, 10.00am – 17.30pm. We recently installed a colourful playground at this Worthing school. Our expert Installation Team created a beautiful design representing the grass, sea, sun and cloud using recycled glass in our Atlantic, Winter Frost, Lemon Yellow and Yellow Green colours. To help mark their 20th Anniversary, we supported Salisbury based charity Hope and Homes for Children to screen the double BAFTA award winning film Finding Family on Sunday 7th September. The film is directed by one of the charity’s very first beneficiaries, Oggi Tomic who tells the moving story of his return to Bosnia to find his family. The centre of Loughborough Junction is defined by a unique feature; from a single point six railway bridges are visible. The seventh bridge, Cambria was the focus of the 7 Bridges launch party on Saturday 6th September. 7 Bridges is an arts led regeneration project, part of which is an interactive reality app called ‘Loughborough Junction World War One’. You can download one of three stories following one of three colour coded (red, blue and orange) trails of individually designed paving slabs. Each colour tells a different story related to World War One. SureSet were happy to support this project by providing the resin bound permeable paving for the slabs. While by design, all of our resin bound paving is permeable, we can (on request) produce a non-permeable version. Read about our InBound® resin bound flooring here. We are delighted to announce that we have recently joined an impressive cross-sector group of organisations dedicated to supporting the www.susdrain.org initiative. This initiative further demonstrates the growing industry support for the widespread delivery of Sustainable Drainage Systems (SuDS). It is anticipated that over the next two years there will be a significant increase and improvement in the delivery of SuDS, with positive change driven by new guidance and the potential implementation of National Standards for Sustainable Drainage. susdrain will help support improvements in SuDS delivery through a range of initiatives including new resources, summaries of the latest guidance, case studies and a series of topical SuDS events. We are one of 29 organisations including Defra, the Environment Agency and other key industry players involved in this project from September 2014. Since its launch in 2012, susdrain has provided a valuable range of resources for those involved in delivering SuDS. Susdrain will continue to support drainage and highways engineers, planners, urban designers, landscape architects, land or housing developers, suppliers, flood risk managers, biodiversity/environment managers and the general public to increase knowledge and confidence in the delivery of SuDS. Click here for more information about SureSet and sustainability. 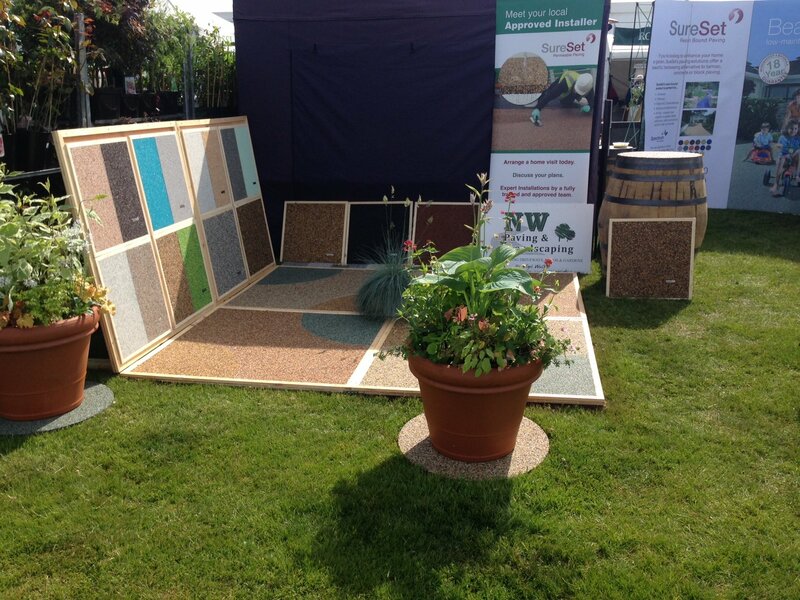 Landscape and Garden Designers, Darren Rudge and Helen Wood “Spiced up” their Stand with SureSet permeable resin bound paving at this years’ BBC Gardeners World Live. SureSet’s Installation Team successfully completed a “First Rate” 15m² pathway of 6mm Maple permeable resin bound paving to compliment the Garden’s nautical theme. The ‘Spice Garden’ can be found at Stand RH55, where on Thursday 12 June at 9.30am, local Michelin Starred chef Glynn Purnell will be cooking selected recipes based on the spices in Darren’s garden. We had the opportunity to support one of our newest Approved Installers, High Standards UK Ltd with their landscaping display in Somerset at the famous Bath and West Show. Being part of a show focusing on the affects of flooding on local farmers and homeowners, High Standards were proud to showcase our specialist permeable resin bound paving products to thousands of interested visitors keen to help prevent future flooding. I (Yvonne) went to the show to help show our support to Ben Cains and his team who, I have to say, were very welcoming and extremely professional with the general public who approached their beautiful stand. The interest in the company and their hard landscaping products and services was very high and I believe will result in more work for them. For more information about High Standards, visit their website www.highstandardsuk.com or follow them on facebook. We are at the Homebuilding and Renovating exhibition, showcasing our wide range of market-leading products. Taking pride of place on our stand will be ‘SureCell™’ the new base alternative. Developed specifically as an eco-friendly alternative to asphalt or concrete bases on new build or extensions to existing paving, it has the additional benefit of being free draining and making it ideal for residential applications. SureCell™ is an environmentally friendly reinforced cellular base structure made from recycled plastic, that when installed is filled with loose stone to form a free draining base layer ready for SureSet Resin Bound Permeable Paving. Also on our stand will be a display of the NEW SureSet TradePack™, the latest extension to our external paving options. We now supply TradePacks to all self builders who want to install our specialist resin bound paving product on projects. Each pack is made up of bagged aggregates and pre weighed resin sufficient to cover 30m² each. The choice of blends will currently be 6mm Sterling, 6mm Barley Beach and 6mm Norwegian Pearl. For more information on SureCell, TradePacks or any of our complete product range, visit us at the National Homebuilding and Renovating show from 27th-30th March (stand number G150), or call the company’s Technical Sales Team on 01985 841 180. SureSet, would sum up this year at Ecobuild exhibition as hugely successful, with an even balance of architects, main contractors, property developers and homeowners on the stand, keeping the footfall of visitors consistent. This year we really focused on the current concerns of flooding and came to the exhibition showcasing our new SureCell base structure, a fully permeable base system to help provide further permeable paving solutions. Our very knowledgeable SureSet Team: Ben Shave (Technical Director), Hugh Haines (Business Development Coordinator) and Jacqui Anslow (Sales Advisor) were at this year’s exhibition to answer all your technical questions and provide valuable advice. They would like to thank everyone who came to visit the stand including Bowmer and Kirkland, Tesco, Long Rake Spar, BALI and Paving Expert just to mention a few. All SureSet installations are backed by a comprehensive 15 year guarantee; SureSet resin bound paving provides a highly attractive, robust and long-lasting surface that requires virtually no maintenance. The low energy material is mixed cold on site and hand floated by skilled installers to deliver a smooth finish, ideal for areas where wheelchairs and pushchairs may be used. Now with the added option of a SureCell base we can really help make a better environment. If you couldn’t make the show or didn’t get time to visit our stand, we would be more than happy to send or discuss the information you require. SureSet will be exhibiting at this years Architect @ Work Show, stand 78, where we can show how creative our permeable Resin Bound Paving can be. Register online to get your free ticket at www.architect-at-work.co.uk. The award winning Grand Designs Live show came to Birmingham this month bringing with it a host of exciting and inspiring design ideas. SureSet were there to support Russell from Rio Landscapes who was competing in the final of the Show Garden Competition. For all of you who took up the Free* and 2for1 ticket offers to attend the show, we hope that you enjoyed it as much as we did. There was a great buzz around the Arena as the competition came to a close and the judges made their final decision on the winning design. Russell walked away with 2nd place and was highly commended for his garden and concept. His garden proved so popular that he was even approached by someone who wanted to buy the garden! We were incredibly proud to have been part of such an exciting and inspiring design and look forward to seeing more of Russell’s work in the future. We were thrilled to hear that a garden which featured SureSet’s loose recycled glass at this year’s Harrogate Autumn Flower Show have received an award. Winning a Silver Gilt award in the inspirational gardens category, the ‘Under the Rainbow’ exhibit, designed by Sally Kimmis, was created with a Wizard of Oz theme to inspire young children and encourage them to have a hands on involvement with planting and growing their own organic produce. The designer chose to feature SureSet recycled loose glass to represent the yellow brick road from the Wizard of Oz. Selecting the 3mm Daffodil Yellow to provide the perfect complement to the other bright and colourful garden features, also made from recycled materials has had a huge impact with plenty of Radio and TV attention particularly ITV’s Daybreak with presenter Laura Tobin. SureSet, the UK’s leading provider of permeable resin bound paving, is set to feature their new loose coloured recycled glass at this year’s Harrogate Flower Show. 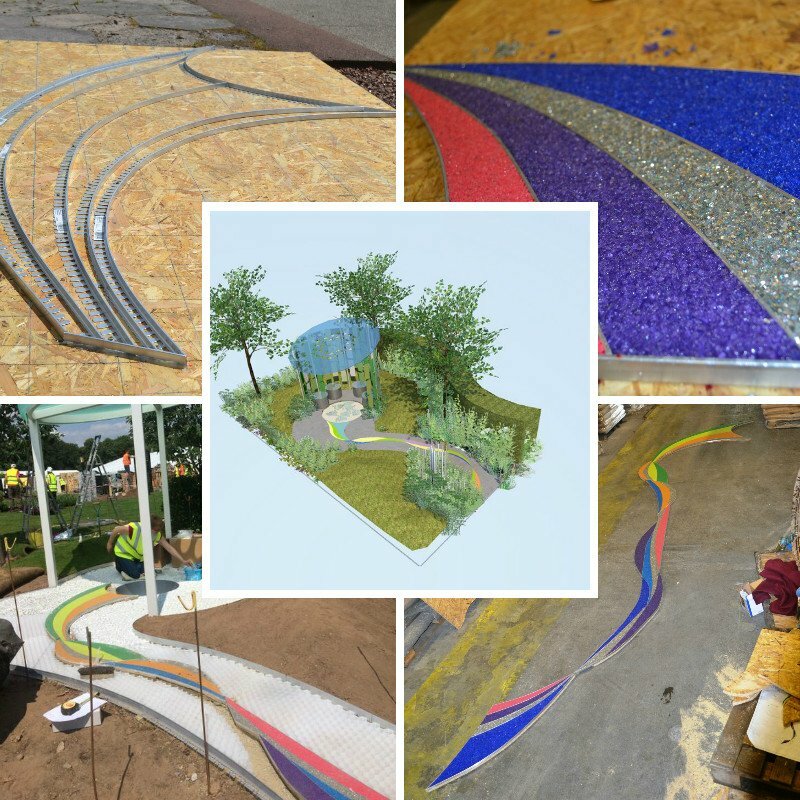 SureSet has teamed up with garden designer, Sally Kimmis from Fleurs de Filles to provide an eye-catching pathway for a community based garden designed to introduce children into gardening. The garden is entitled ‘Under the Rainbow’ and is based upon The Wizard of OZ. The pathway within the show garden is the main focal point and needed to represent a yellow brick road, using a recycled material. Due to SureSets recent release of their new loose coloured recycled glass their Daffodil yellow glass was an absolutely perfect material for Garden designer Sally Kimmis to use. Visitors to the Flower Show will be able to see and gain further information on the SureSet recycled loose glass. Developed in-house by their Research and Development team they have designed a bespoke range of coloured glass in over 20 funky colours. The glass can be used for a variety of applications including around flower beds, roof garden, in water features or even for use in concrete mortar finishes and terrazzo flooring. Whilst visitors discover SureSets recycled loose glass range, I’m sure some will recognise them for their more established work using resin bound paving, with the company’s vast colour palette the paving material can help transform their home – adding colour, life and texture to paths, driveways, pool surrounds, patios and garden features. For a brochure, more information or product samples from SureSet, please contact the company’s sales team on 0800 612 5762. Entered into this year’s RHS Flower Show Tatton Park – The belong garden, a sense of place. SureSet were approached by Carolyn Hardern the designer of the belong garden to install the resin bound pathway around the garden. Carolyn was awarded Silver for a garden specifically created for an outdoor space suitable for those living with dementia. The pathway of natural toned resin bound gravel is one of the key elements to the figure of eight design, it helps to enable orientation and aided navigation when enjoying an independent walk, users would have a sense of calm on their stroll within the garden. The belong garden is soon to be relocated to a state-of-the-art care village that specialise in supporting people with dementia, the garden is sure to complete an overall sense of belonging. The 2013 event marks the centenary of the Chelsea Flower Show so it’s going to be extra-special. Every year the grounds of the Royal Hospital are transformed into show gardens, inspirational small gardens and vibrant horticultural displays for the world’s most famous flower show. The Chelsea Flower Show is attended by 157,000 visitors each year and has become an important venue for watching emerging gardening trends. New plants are launched and the popularity of older varieties revived. It’s the garden design equivalent of Paris Fashion Week. We were delighted to be approached by BALI (the British Association of Landscape Industries) to provide an eye-catching surface for the organisation’s display area at the iconic show. A bespoke colour was developed especially for this show garden, a glistening silver crushed glass surface which we called ‘BALI Bloom’. The show opened to the press on Monday with the BALI stand being awarded a certificate of commendation by the judges on the first day! 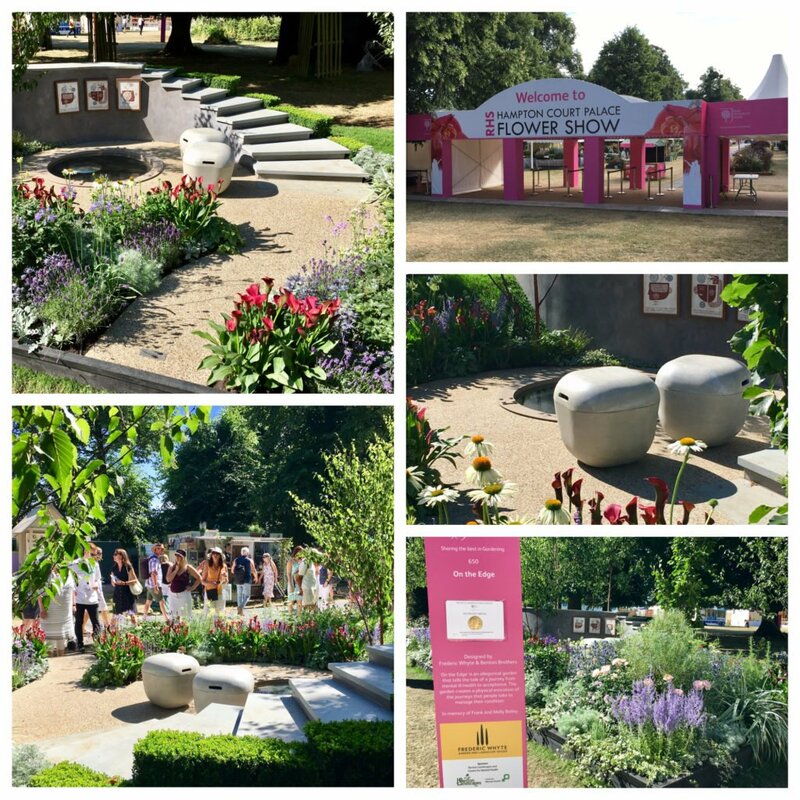 This is the second year in a row that our surfaces have been incorporated into show gardens and received commendations and awards. Last year, we were part of a design that took the Gold. Make sure you visit stand FR36 to see our dazzling surface in BALI’s beautiful stand! You will also get to meet one of our team; Hugh Haines who will be at the show on Thursday. For all of the latest updates from the show, follow us on Twitter: @SureSetUK or use the hashtag; #RHSChelsea. Amidst the spectacular grounds of The Royal Chelsea Hospital, SureSet has teamed up with BALI (the British Association of Landscape Industries) to provide an eye-catching surface for the organisation’s display area at the iconic show, which will see the installation of a product developed especially for Chelsea, our silver ‘BALI Bloom’. 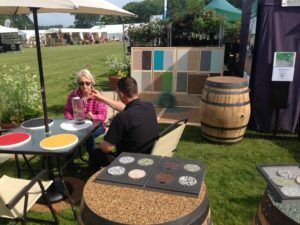 Visitors to the Flower Show will be impressed by our vast colour palette and discover how our paving material can help transform any home – adding colour, life and texture to paths, driveways, pool surrounds, patios and garden features. The design, by Charlotte Murrell, is to be intriguing and encourage people through the space. SureSet permeable paving offers a modern, long-lasting alternative to traditional materials. The colour range provides almost limitless options for home owners and garden designers, from natural buffs and shades of terracotta to rich, vibrant primary colours. Quick and easy to install, using either the simple DIY kits or one of a national network of approved SureSet installers, the paving also provides a fully permeable surface which allows water to freely drain through. 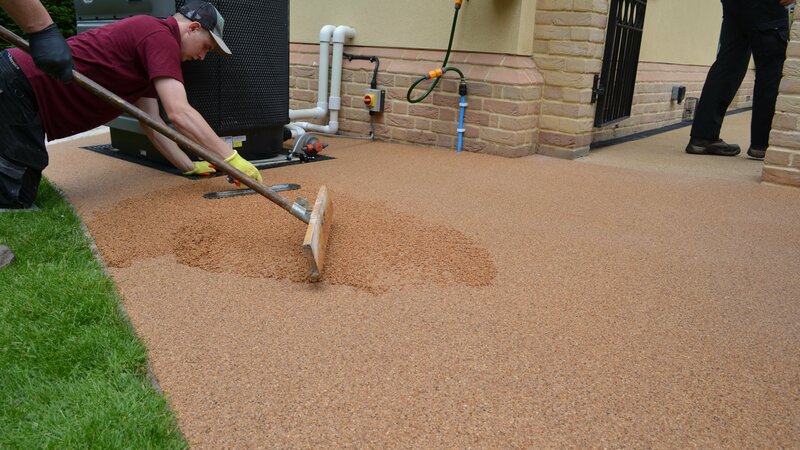 All SureSet resin bound paving is highly durable, UV stable, and resistant to frost, oil and stains – ensuring that its appearance won’t fade or be compromised over time. The low maintenance surface also provides a smooth base for wheelchairs, children’s buggies and bicycles and comes with a market-leading 15 year guarantee for added peace of mind. During an extremely busy Ecobuild exhibition SureSet, the UK’s leading supplier of resin bound paving solutions, unveiled a new CPD presentation and launched a Free Logo offer for both its internal and external surfacing systems. The Free Logo offer is available on any order over 200 square metres, allowing customers to choose a logo, emblem or message to incorporate into their scheme in up to four colours within a 500mm x 500mm area. SureSet’s permeable paving systems deliver great aesthetics and low-maintenance performance and with a wide range of colour options, the design options are almost limitless to create long-lasting paths, access roads, driveways, courtyards and entrance areas as well as showrooms, offices and reception areas. The addition of a logo provides a distinct touch of individuality and personality to any scheme, with schools, offices and health centres across the UK having already benefitted from this SureSet service. During the exhibition, SureSet also delivered its latest CPD presentation to an audience of interested visitors. Covering the key features and benefits of resin bound paving, as well as some of the main design options and technical considerations, this certified presentation has been developed to provide architects with a broad introduction to the material, illustrated with a number of case studies and project applications across the UK. Commenting after the show, SureSet’s Senior Marketing Coordinator, Yvonne Philp said: “We were delighted with the reaction we received at Ecobuild, both to our range of permeable surfaces on display and to the new services that we launched at the show. Having spoken to a number of architects, we put together the new CPD presentation to contain a mix of project, product, design and installation information to provide a general introduction to resin bound paving. Our Free Logo offer has also provoked a great deal of interest and we?re looking forward to installing some really individual schemes over the coming months”. For more information on the company’s extensive product range, or for details of the Free Logo offer and CPD presentation, please call the company’s experienced support team on 01985 841 180. 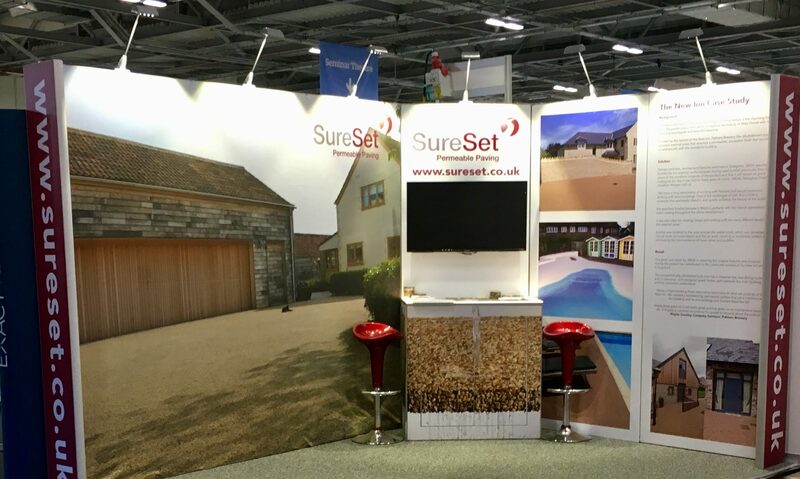 Everyone at SureSet is looking forward to exhibiting at The National Homebuilding and Renovating Show which is being hosted at the NEC Birmingham later on this week. The show lasts a total of 4 days starting on the 29th of March and finishing on the 1st of April. We are predicting a busy one and to give visitors more enjoyment from learning about our products we are offering them the chance to win a patio in our latest competition. Up for grabs are 20 SureSet DIY kits, specially made for homeowners to be able to install their own patio. These kits are easy to install, come with full instructions and will leave you with a permeable and beautiful surface which will keep its looks for many years to come. So if you are planning on attending the Homebuilding & Renovating Show this week then pay us a visit on stand K128, learn about all of our new products and offerings and enter our competition for a chance to win a high quality resin bound patio. We look forward to seeing you. Here at SureSet we are excited to announce that we will be exhibiting at the 2013 Outdoor Design, Build and Supply Exhibition in Dubai. We will be showcasing in partnership with our international agents Tanseeq who are based in Dubai and widely promote and install SureSet across the country. Outdoor Design Build & Supply is a trade show held in Dubai, UAE, focused on the design, build and supply for all private and public outdoor space – including public parks, municipal works, private and palace gardens, green areas within urban areas, major residential, commercial and leisure projects, agriculture, irrigation and landscaping. As a one- stop-shop in the region for the outdoor built environment, the exhibition has been carefully designed to fill a gap in the market for a dedicated showcase that caters for the design, build and supply for the regions fast expanding public and private green spaces. We will provide you with a new, fresh platform to network and do business in the wider Middle East region. In addition to irrigation, water management, horticulture, planning and design, exhibitors will showcase a wide variety of hard and soft landscape products and services from outdoor lighting, recreation and park equipment, to water features, playground equipment and outdoor tiles. Visitors will include a range of key buyers from the industry including Municipality Buyers, Landscape Architects, Garden Designers, Public Parks and Horticulture Directors, Government and Urban Planning Officials, Procurement Managers, Contractors, Developers, Consultants, Distributors, Wholesalers, Retailers, Leisure Industry Destinations, Garden Centres, Sporting and Stadium Procurement Managers. The show runs from 25th-27th March 2013 at the prestigious Dubai World Trade Centre. For more information or to book tickets, please visit their website by clicking here. To find out more about Tanseeq, click here. Ecobuild is the world’s biggest event for sustainable design, construction and the built environment. Having featured 1,549 exhibitors, a cutting-edge educational programme and dozens of interactive attractions in 2012, Ecobuild cemented its position in the industry, attracting over 57,000 attendees. This year SureSet will be exhibiting with Bali, the British Association of Landscape Industries established in 1972 as the UK’s representative trade association for the landscaping sector. Their membership scheme comprises of interior and exterior landscapers and designers, grounds maintenance contractors, and companies supplying industry-related products and services. Bali ensures all members are committed to delivering professional excellence. If you have any questions regarding Permeable resin Bound paving, please meet our knowledgeable team members on Stand S1905 in hall S7, we welcome you all. There are many topics being discussed, including one on Permeable Resin Bound Paving, visit the CPD zone in the north hall N2020. Grand Designs Live, the UKs top contemporary home show, returns to the NEC from 12-14th October 2012. Presented by design guru Kevin McCloud, and based on the hugely popular Channel 4 series, the show offers visitors a unique opportunity to see all the latest trends for the home. With areas dedicated to interiors, technology, kitchens, bathrooms, build and gardens, there’s something for every room in your home. And with over 500 exhibitors, you can shop from a great selection of brands with 100’s of items not available on the high street. With all this and much more, make sure you plan a GRAND day out this October! 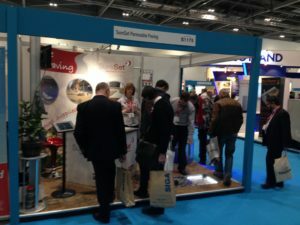 To claim your free Friday ticket, visit www.granddesignslive.com, go to ‘book tickets’, enterpromotional codeRIOLSFREE when prompted, then simply print off your ticket. We have teamed up with Grand Designs Live and have 50 pairs of tickets to give away for the opening day! Don’t miss the GRAND show garden!….SureSet are set to work with Rio landscapes, a confirmed finalist of the Grand show garden competition at Grand Designs Live Birmingham NEC from the 12th-14th October 2012. Come and visit the show garden and see a contemporary and inspirational design with the Grand Designs ethos and use of sustainable and ethical products. The Green Retreat show garden is based on a small courtyard/urban garden where space is restricted. The design is modern yet simple, with interlinking rectangular structures providing the theatre and defining the space. It is intended to provide a Green Retreat, a pleasant sanctuary with a calming tranquil environment set amongst the urban sprawl. The design replaces typical elements found in traditional garden for replicas and sustainable alternatives that echo the traditional qualities whist being innovative, functional and durable. Green is the overriding colour which even spreads down to the flooring, using various greens for the SureSet ‘SpectrumTM‘ and ‘Fusion®’ colour range, the permeable resin bound aggregates form the bold, sleek modern rectangular stripes. Russell Osborne, designer of the Green Retreat, is a Landscape Architect with over ten years experience in private practice and garden design. He has worked on many diverse international and UK projects and designed several award winning show gardens. He is extremely passionate about innovative design and committed to redefining gardens, their perception and importance. SureSet are so pleased to be working with someone who shares the same attributes when bringing a design to life. T&C’s *Free tickets- Offer valid on Friday 12th October 2012 only, offer valid on standard admission tickets only, offer ends 12/10/12, tickets must be booked in advance, max 2 tickets per household, non transferable, all tickets will be checked and verified on entry, print at home tickets only, subject to limited availability, tickets allocated on a first come-first served basis. **2for1 offer: Transaction fee of £1.70 applies per order. Tickets must be booked in advanced. Offer ends 14/10/12. Offer valid on standard admission tickets only. Saving based on the door rate. Everyone at SureSet is excited to be exhibiting at two popular shows this year. Next month we will be at the Surface Design Show and then at the end of March we are at the Homebuilding and Renovating show. Would you like the opportunity to visit SureSet on our stand, meet some of our highly knowledgeable team, learn about our products and be the first to see our new Internal flooring range? Request a complimentary ticket today by contacting us or registering below by following the link on the exhibition logo of your choice. The Surface Design show, London 2012 7-9th February @ Stand 420. Retaining all the qualities that makes SureSet ideal for such a long list of applications with the option of a sealed water resistant finish, InBound is the perfect solution for interior projects. Come to our stand K128 and discuss any of your current or potential projects with our team. We can provide as much information on our newest product ranges, build up requirements and much more. There will also be the opportunity to work with our resin bound material at our DIY table.